At Precision Landscaping & Lawn Services, Inc, we tailor our design and maintenance services to meet your specific needs. Our professional teams specialize in the beautification of your home, business, or development. From small common areas to large business parks, no job is too big or too small for our services. Call to receive your personalized quote today. 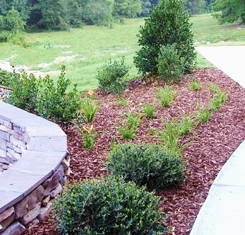 Make an excellent first impression with the help of Precision Landscaping & Lawn Services, Inc, your source for innovative exterior designs and yard maintenance in and around Lexington, North Carolina. We create gorgeous landscapes for homeowners, HOAs, and commercial businesses at rates within your budget. From spring and fall cleanups to removing snow in the winter, we do it all. All of our landscaping services are customized to meet your specific needs. We are here to enhance your property. Our team is fully licensed and insured, ensuring quality work every time. We are committed to building long-term relationships with our clients and have been working with many of the same HOAs and businesses for more than 25 years. We pride ourselves on our professional approach to meeting your needs, our attention to detail, and our ability to deliver reliable services. All employees wear uniforms and are easily recognized when they are on your property.